We get the feeling that we're going to see more and more EA Sports titles supporting co-op. Setting the bar with a semi-cooperative online mode, NHL 2009 breathed new life into the game lineup for sports fans. 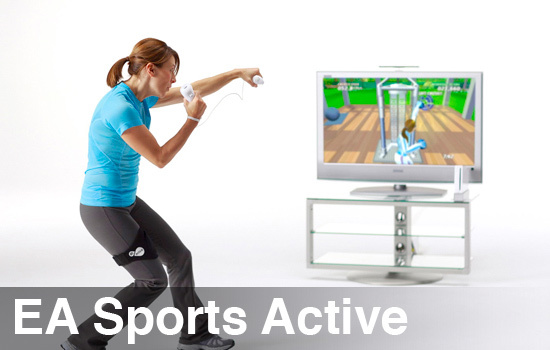 EA Sports Active: Personal Trainer seeks to raise that bar in a new way. To start off, you are prompted to create a likeness of yourself. Severely limited avatar options pretty much make this process more annoying than anything else. We've created Avatars, Miis, Guitar Hero stars, etc...your Personal Trainer likeness will just end up being a conversation piece -- something that you'll inevitably have to explain when asked, "If it's supposed to be you, then why doesn't it look like you?" Once you've trudged through the six-or-so step creation, you are taken to an interface that represents a slick reference card, where you can track your progress and plan future workouts. From here, you can change your settings, create a customs workout, and choose your mode: single player, or co-op. The game itself works pretty well. 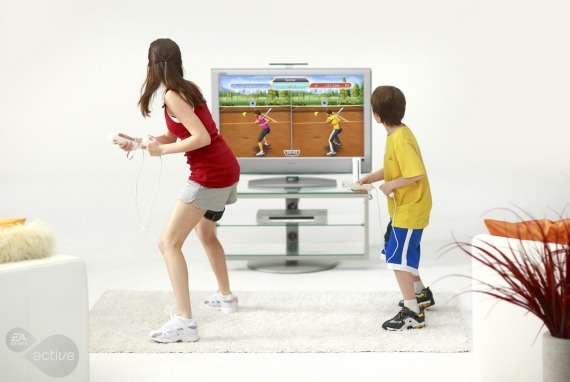 Included in the package is a neoprene leg strap that allows you to position the Wii nunchuk in a way that enables the console to determine your leg position. Running, squatting, and other activities that require leg movement are replicated by your on-screen likeness, and the result is impressive, even if the avatar animation is pretty clunky. Currently, EA Sports is running a 30-Day Challenge that you can participate in directly from your menu screen. You can also watch your weight via the Wii Balance Board, and you can even track your diet. Data such as calories burned is recorded each time you complete a workout. The amount of data collected is more interesting than useful, but since I've always been an advocate of including more options than necessary in a video game, this suits me fine. While the Balance Board can be used for a handful of activities within the different workouts, it is limited to single-player only. Probably my biggest gripe about Personal Trainer is that you are pressured to buy a second accessory set if you want to try any real diversity of activities with your co-op buddy. The accessory set retails at $19.99, a huge rip-off for just a neoprene leg strap and a resistance band. Trying to use a belt or rag to tie on the nunchuk just presents two problems: #1 - the game is very senstitive about making sure the nunchuk is at the right angles on your thigh, and #2 - it's just not worth jury-rigging a Wii nunchuk so you can run laps. Sorry...but it's true. EA Sports Active: Personal Trainer is a game that I look forward to getting more time with. Whereas I can gain Acheivements and Trophies on other consoles, I can now meet personal fitness goals on the Wii, and Personal Trainer seems to bypass the 'gimmick' category in an attempt at serious functionality. It's just too bad that another developer sees co-op as an opportunity to seduce a second buyer, which doesn't fly at my house. Despite its surprisingly good practical purposes, Personal Trainer will probably never fully unite my wife and I as co-op workout buddies, but rather supplement our real workouts with a few interactive elements. The Co-Op Experience: Choose a workout or create your own, then invite a friend to join you. Scoring is competitive for some activities. Page created in 0.6022 seconds.